The first two editions of this title, published by SAE International in 1990 and 1995, have been best-selling definitive references for those needing technical information about automotive fuels. This long-awaited new edition has been thoroughly revised and updated, yet retains the original fundamental fuels information that readers find so useful. This book is written for those with an interest in or a need to understand automotive fuels. Because automotive fuels can no longer be developed in isolation from the engines that will convert the fuel into the power necessary to drive our automobiles, knowledge of automotive fuels will also be essential to those working with automotive engines. Small quantities of fuel additives increasingly play an important role in bridging the gap that often exists between fuel that can easily be produced and fuel that is needed by the ever-more sophisticated automotive engine. This book pulls together in a single, extensively referenced volume, the three different but related topics of automotive fuels, fuel additives, and engines, and shows how all three areas work together. It includes a brief history of automotive fuels development, followed by chapters on automotive fuels manufacture from crude oil and other fossil sources. One chapter is dedicated to the manufacture of automotive fuels and fuel blending components from renewable sources. The safe handling, transport, and storage of fuels, from all sources, are covered. New combustion systems to achieve reduced emissions and increased efficiency are discussed, and the way in which the fuels’ physical and chemical characteristics affect these combustion processes and the emissions produced are included. There is also discussion on engine fuel system development and how these different systems affect the corresponding fuel requirements. Because the book is for a global market, fuel system technologies that only exist in the legacy fleet in some markets are included. The way in which fuel requirements are developed and specified is discussed. This covers test methods from simple laboratory bench tests, through engine testing, and long-term test procedures. 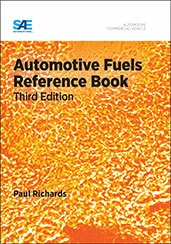 If you do not have access to SAE MOBILUS via username/password or institutional access, you can still purchase the Book, Automotive Fuels Reference Book, Third Edition.